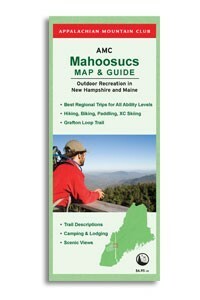 AMC Mahoosucs Map & Guide, cartography by Larry Garland, 2010. AMC map shows hiking, road and mountain biking, paddling and X-C skiing opportunities in the scenic and relatively less-visited Mahoosuc Range region along Maine-New Hampshire border. Coverage extends from Berlin-Shelburne area north to Umbagog Lake and Appalachian Trail as far as Bemis Mtn. Scale is 1:95,040; contour lines not shown. Shows hiking trails with mileages between points (including entire Grafton Loop Trail), campsites, and paddling, biking and X-C ski locations. Reverse has general information on area plus descriptions of 15 hiking routes, 7 paddling routes, 5 X-C ski areas, 4 road biking routes, and 3 mountain biking areas; these are keyed to numbers on map. Printed on regular paper, folded to 4" x 9."